Before we see the plugin in action, let’s see how to install it. To initialize Classily.js, add script tag to your HTML document with path to Classily.js. Next, make new Classily instance and you are good to go! where selector: ".my-classily-element" is a trigger selector—an element which will trigger class toggle action—usually an anchor or a button. Default selector is .js-classily. Once you installed and initialized the plugin, you are ready to use the plugin and discover many new ways how the plugin could be helpful. Which options does Classily.js have? data-target option is used for targeting elements. We target elements by providing selectors for querySelectorAll() function. data-class option is used to pass class names that will be toggled on targeted elements. toggling multiple classes on multiple selectors. When a number of selectors and classes are equal, then each selector could be toggled with a different set of classes. For example, if we pass two selectors separated with comma character and two classes separated with comma character, the first class will be toggled on elements targeted with the first selector, and the second class will be toggled on elements targeted with the second selector. When a number of selectors and classes are not equal, then all provided classes will be toggled on every element targeted by every selector. For example, if we pass two selectors separated with comma character and three classes separated with comma character, all three classes will be toggled on every element targeted by two selectors. Enough theory, let’s see this plugin in action. data-class="blue" is used to provide a class or classes that will be toggled. As you see, Classily.js is not complicated to use. In fact, it looks like it cannot do much, but I want to reassure you that is not the case. Stay with me; I will guide you through examples. How to toggle the same class on multiple elements? If you click on the “Toggle button” in the example below, you should see that both headings will change color. By adding the same class .my-class on target elements we are targeting both headings at the same time. That is because Classily.js uses querySelectorAll() function. There is another way how we could achieve the same effect—we could provide a comma-separated list of selectors. How to toggle multiple classes on multiple elements? In the example below, we are toggling two different classes on two separate elements. The number of comma-separated selectors must match the number of comma-separated classes. Notice that second element is toggling two different classes, hidden and blue—we could provide more that one class by using space as separator. Pretty awesome, right. Are you ready for more advanced examples? 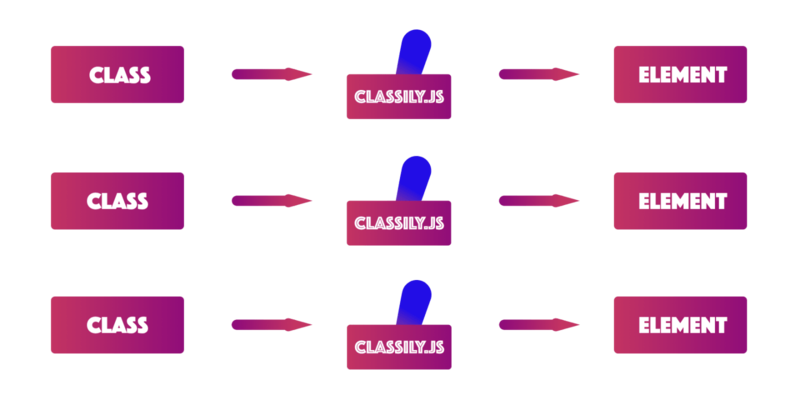 How to use Classily.js for toggling states? Once we activate “blue”, “red” or “gold” state, the heading could never go back to default state. First, we are targeting .my-class element with .red class. If there is no such element, Classily.js will skip this step. If the element exists, then we remove .red class. Repeat the same for the .gold class. Then, we are targeting .my-class element that doesn’t contain .blue class. If the element exists, then add .blue class. The heading is now in “blue” state. The same is for “red” and “gold” states. The method above could be applied to create tab section, feature seen on many websites, for example. When the user clicks on a tab, different content appears. Does Classily.js have special features? Often there is a need to switch the state of the element itself, like the button in this example. To avoid usage of complicated selectors, we could use the keyword this. In this example, we used anchor tag as a button. There is another feature that is useful—we could prevent default behavior, like opening a link. To do that, we should use data-prevent="default" option. For more Classily.js examples, check this Codepen collection. Classily.js is helping me with my everyday job. I no longer have to jump from template file to script file to execute simple tasks like class toggling. And I’m able to achieve some pretty nifty tricks with it. Share it, like it, star it, tweet it! Also, don’t hesitate to report an issue, if you find any. And if you know how to make tests for this plugin, let me know how.